Eyes on Media. Commentary and opinions on what's happening, not happening and ought to be happening. What, not and ought. Hey NFL, Maybe Stop Playing the National Anthem? Ok? Why do American sport franchises, football to baseball, insist on playing the national anthem before games? How did this tradition get started? Wartime tradition. The anthem is a war song, a “battle” like sports? What’s the purpose of a pregame ceremony? To tease the sweaty throngs who witness athletic feats and hoped-for mayhem. To whet their appetite with a little taste of blood, guts and glory. It’s a football game. Like the motto of the Secondary School in Sierra Leone where I once taught: “Play The Game.” Just play the damn game. And what does the American flag have to do with any sport? Why should players and fans be asked to declare their respect, allegiance or love of country by placing hand over heart and singing a national anthem? Because it’s a nice thing to do, some say. Because it allows people to express their communal national fidelity say others. But why at a sporting event and not at a performance of a Verdi opera, a movie or rock concert. What is so inherent in sports to demand a mass display of nationalistic patriotism? Last year NFL quarterback Colin Kaepernick kneeled rather than stood during his team’s presentation of the national anthem. He said he was protesting racism and police brutality in America. Now, the talented quarterback, who opted out of his contract with the San Francisco 49ers this year, is being blacklisted by other NFL teams as punishment. No team will hire him because he exercised his 1st Amendment right to express his opinion. What if a player wasn’t protesting anything or trying to make some sort of statement by not standing during the singing of the Anthem? What if a player is just too lazy to stand or simply chooses to kneel, crouch or sit rather that stand? Will he be blacklisted for his act of not standing? Is it the act of protest or the act of refusing to stand that gets the player in trouble? How many TV viewers even watch, let alone stand in front of their TVs, hand over heart, while some NFL-approved singer belts out their unique version of the Star Spangled Banner before a game. Confess. If you walk out of the room to grab a beer or mute the sound or remain sitting in your laz-a-boy when the singing begins before the game then are you just as “unpatriotic” as Kaepernick? Or maybe you are protesting racism? Or is there an unwritten rule that says you only have to stand when physically in the stadium or stands? And why are the seats located in the “stands” anyway? Recently other NFL players have demonstrated support of Kaepernick by refusing to stand for the anthem before preseason games. If support from more players, the majority of whom are Black, continues, the NFL might have a problem on its hands. Solution: dispense with the pregame display of patriotism, flag waving and singing the national anthem. And no military jets flying over the stadiums. Why conflate a nation’s military prowess with a sporting event? Or we could go full-flag nationalistic. The Philippines recently proposed a law requiring citizens to sing along enthusiastically whenever the national anthem is played in public. “The singing shall be mandatory and must be done with fervour,” the Bill states. The law would also mandate the tempo of any public performance of the anthem – it must fall between 100 and 120 beats per minute. If the Bill, which will be considered by the Senate, is approved and signed into law, a failure to sing the anthem with sufficient energy would be punishable by up to a year in prison and a considerable monetary fine. A second offence would include both a fine and prison time, and violators would be penalised by “public censure” in a newspaper. The Supreme Court in India ruled last November that movie theatres would be required to play the national anthem before screenings, and that moviegoers would be required to stand. But back to the good old U.S.of A. If sport fans insist on some type of pregame ceremony, song or performance, then how about a mini-scene from a Shakespeare play, a dramatic reading from Homer’s The Odyssey, an aria from “Rigoletto or a preview of a movie or simply a Queen standard such as “We Are the Champions,” or “Bohemian Rhapsody” (my vote); or an act by a gaggle of juggling street mimes or sword swallowers. Ringling Brothers circus recently closed shop so there must be a surplus of good acts or clowns willing to perform. But if more NFL players choose to support Kaepernick then maybe NFL stadiums will have to install kneeling benches, like in some churches. Football is almost a religion in America anyway. Just saying. Next Next post: Apple To Drop Face Scanning in Next iPhone XI…Rectal Scanning the Next Big Thing. 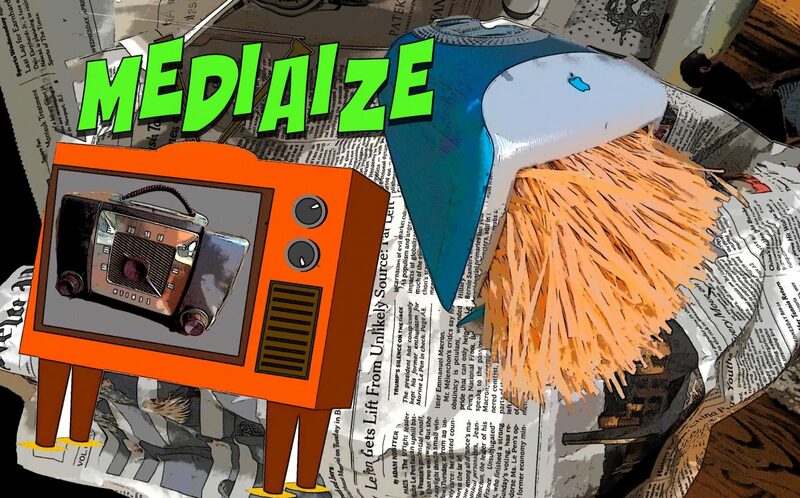 Mediaize : this site STILL under construction Blog at WordPress.com.